Today, I received my first shipment of the purple tea that I blogged about back in August. I opened the bag with no preconceptions, as I haven’t read anyone else’s tasting notes. The leaves look like pretty much any black tea. 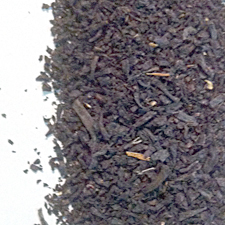 Not surprising, as the purple tea plant (TRFK306/1) can be prepared using any tea process, and this was oxidized like a traditional (orthodox) black tea. This is a very dense tea. The kilogram bag I purchased was the same size as the half-kilo (500g) bag of Golden Safari (a Kenya black I’ll be writing about soon). I took a deep whiff, and picked up a slight earthiness to it that isn’t present in the other Kenya black teas I’ve tried. Not as extreme as a shu pu-erh, of course, as there was no fermentation in the process, but enough to distinguish the aroma from a traditional black tea. Actually, despite my previous comment, I did come in to this with one preconception. Since this is a high-tannin tea, I expected a fair amount of astringency (“briskness,” as Lipton calls it), so I decided to take it easy on the first cup and make it like I make my 2nd-flush Darjeelings: 5 grams of leaves, 16 ounces of water at full boil, and a scant two-minute steep time. 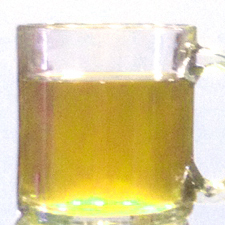 An interesting color for a “purple” tea prepared with a black tea process. The leaves settled immediately to the bottom of the pot, and I was taken by surprise by the color. I did not expect purple, as the anthocyanin that gives purple tea its name doesn’t affect the color of black tea. But I also didn’t expect the pale greenish tan color that immediately appeared (it later mellowed to a deep black with — you guessed it, a purplish tinge). We don’t have any analyses yet of total antioxidant content, but we know that the anthocyanin does contribute quite a bit. My first taste of the purple tea was impressive. Rich, complex, and a bit more astringent than you’d expect with only a two-minute brewing time. The earthiness in the aroma comes through subtly in the taste, and there’s a silky mouthfeel that lingers on the back of the tongue. I figured that there was enough going on in that tea that it could hold up to a second infusion, so I brewed a second cup off of the same leaves. This time I gave it a three-minute steep, and it came out tasting very similar to the first brew, although a bit more pale in color. All in all, I’m pleased and excited to have this new varietal available at the tea bar. Purple tea is certainly not cheap. At $16.00 per ounce, it’s one of the priciest teas on our menu, but I expect it to build a fan base quickly. Our new tea website isn’t quite ready to launch yet (I’ll make a big announcement here when it is), but if you’d like to order some Royal Purple tea, just call the store (406-446-2742) or send an email to gary (at) redlodgebooks (dot) com. We’re ready to ship right away. UPDATE MAY 2012: Our tea website is up and running, and Royal Purple tea is now available for purchase. More more information about purple tea, please see my earlier blog post announcing and describing the varietal. Posted on 3 November 2011, in Styles & Blends and tagged anthocyanin, antioxidants, astringency, black tea, Darjeeling, health, Kenya, pu-erh, purple tea. Bookmark the permalink. 1 Comment. I found this post (and your blog) just now when searching for tea bloggers writing about purple tea. I have a sample of this tea that I almost brewed up just now, but decided not to…I’m currently drinking some Assam. I’m hoping to brew it soon though. It was really interesting to read this post about your experience drinking it…this is not what I would expect. I’m curious to see what is going to happen when I brew it up! I was really impressed with another tea I tried from Royal Tea of Kenya, however, their Royal Tajiri Tea. It brewed a dark color, like a typical black tea, but its flavor was extremely smooth and I found it to be an exceptional tea.